It's that time again, Our Valentine's Day Brunch and Tricky Tray is fast approaching, this year it will take place on February 10, 2019 at Seasons in Washington Township. 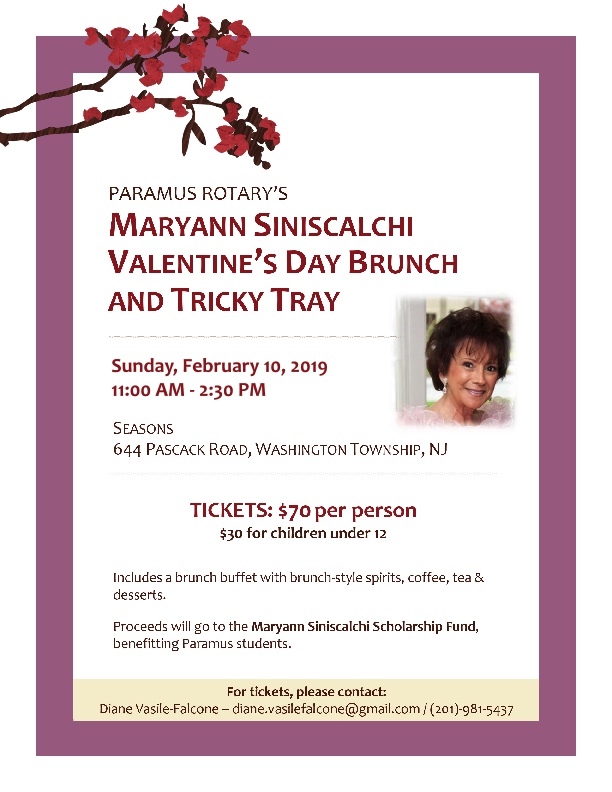 This event is special as it has been named in honor of our dear friend and Rotarian, MaryAnn Siniscalchi and forever will be known as, "The MaryAnn Siniscalchi Valentine's Day Brunch & Tricky Tray". Please note that all proceeds will benefit, "The MaryAnn Siniscalchi Scholarship Fund" that has been established in her memory with in the Paramus Rotary Foundation. These scholarships are granted to High School students residing in Paramus. MaryAnn loved Rotary, her town and, of course, children. What a fitting way to honor her life and memory but to continue to serve and assist others as she was the purest definition of Service Above Self. Therefore, we are looking for this year's results to far exceed our last three year's. Please consider attending this event. It is open to all, friends, lovers and children. Seasons venue as always continues to provide a wonderful event and the array of Tricky Tray items are of the finest quality. We are also looking for donations either in the form of check or raffle items. Anything you can do to support this event will be greatly appreciated. I have attached this year's flyer with the details, please feel free to share with your friends and family as well as any local businesses that you feel would be interested in supporting this event. With 250+ in attendance the last three year's we are expecting this years event to sell out quickly, so register early. If you have any questions or would like forms to solicit any local business please feel free to reach out to me at diane.vasilefalcone@gmail.com or call at 201-981-5437 and I will be more than happy to assist.